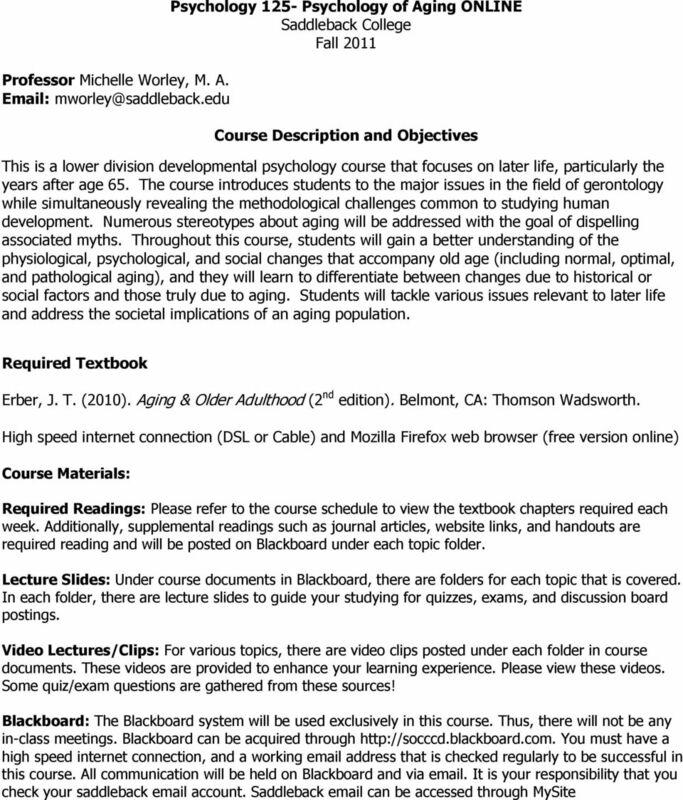 Download "Psychology 125- Psychology of Aging ONLINE Saddleback College Fall 2011. Course Description and Objectives"
4 made up. Please take the exam early if you have prior arrangements on the date of the exam. Please plan ahead! Extra Credit: There is no extra credit available for this course. If extra credit should become available, there will be an announcement posted at a later date. Internet Connectivity: It is the student s responsibility to have a reliable high speed internet connection. If your internet connectivity gets turned off or you have connection issues, then please use the school library, a local library, or go to a spot that has a reliable wi-fi connection. Lack of internet access/connectivity issues are not excuses for not turning in/completing assignments on time. Assignment Submission: It is the student s responsibility to ensure that their assignments are posted/uploaded correctly. Please double check this prior to exiting the classroom to ensure that you will receive grades on the assignments. Late assignments will not be accepted for assignments that were not posted/uploaded correctly by the student. This includes discussion responses, assignments, quizzes, and exams. Technical Issues: Technical issues are not excuses for completing/submitting assignments on time. If you re having technical issues, please contact technical support and send me an with your assignment attached with a ticket number before the deadline for consideration. This includes the initial discussion board response and responses to classmates, too. 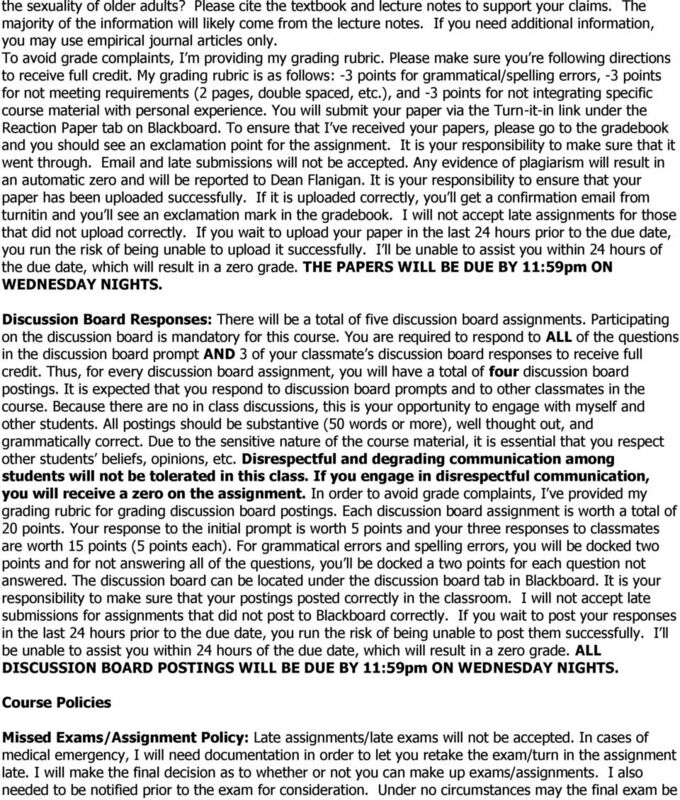 If you wait to complete assignments 24 hours or closer before the due date and run into Blackboard technical issues, then you risk missing out on those points because I cannot guarantee that I ll be able to assist you. Thus, please plan ahead and do not wait until the last minute! Communication: Disrespectful communication is not tolerated in this class. Thus, please make sure that all communication with the instructor and other classmates is respectful. 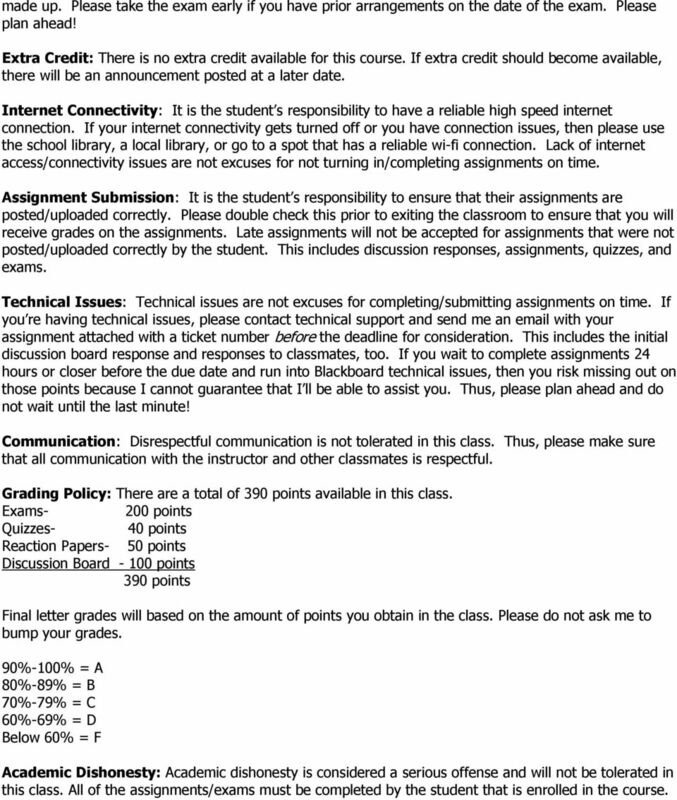 Grading Policy: There are a total of 390 points available in this class. Exams- 200 points Quizzes- 40 points Reaction Papers- 50 points Discussion Board points 390 points Final letter grades will based on the amount of points you obtain in the class. Please do not ask me to bump your grades. 90%-100% = A 80%-89% = B 70%-79% = C 60%-69% = D Below 60% = F Academic Dishonesty: Academic dishonesty is considered a serious offense and will not be tolerated in this class. All of the assignments/exams must be completed by the student that is enrolled in the course. 5 A zero will be given for the assignment/exam and will be reported to the Dean s office. Please do not jeopardize your academic record by even making me suspect that you are cheating. 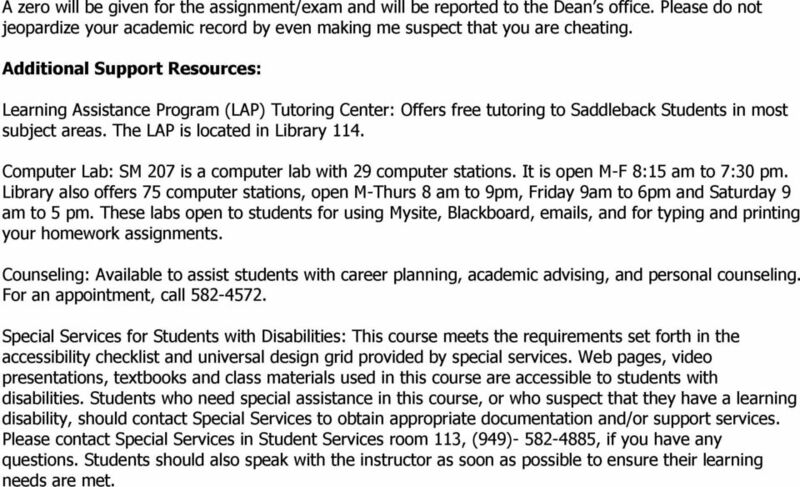 Additional Support Resources: Learning Assistance Program (LAP) Tutoring Center: Offers free tutoring to Saddleback Students in most subject areas. The LAP is located in Library 114. Computer Lab: SM 207 is a computer lab with 29 computer stations. It is open M-F 8:15 am to 7:30 pm. Library also offers 75 computer stations, open M-Thurs 8 am to 9pm, Friday 9am to 6pm and Saturday 9 am to 5 pm. These labs open to students for using Mysite, Blackboard, s, and for typing and printing your homework assignments. Counseling: Available to assist students with career planning, academic advising, and personal counseling. For an appointment, call Special Services for Students with Disabilities: This course meets the requirements set forth in the accessibility checklist and universal design grid provided by special services. Web pages, video presentations, textbooks and class materials used in this course are accessible to students with disabilities. Students who need special assistance in this course, or who suspect that they have a learning disability, should contact Special Services to obtain appropriate documentation and/or support services. Please contact Special Services in Student Services room 113, (949) , if you have any questions. Students should also speak with the instructor as soon as possible to ensure their learning needs are met. 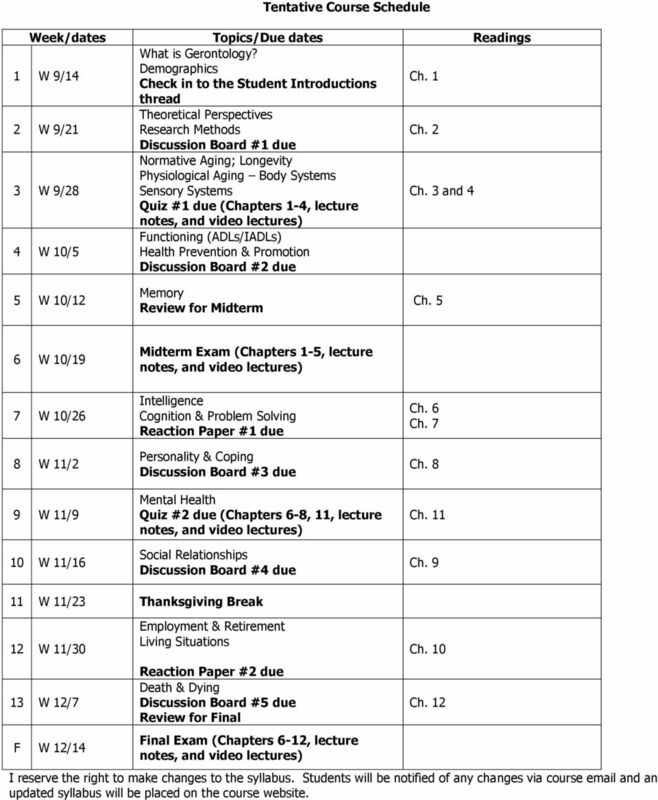 6 Tentative Course Schedule Week/dates Topics/Due dates Readings What is Gerontology? 1 W 9/14 Demographics Check in to the Student Introductions Ch. 1 thread 2 W 9/21 Theoretical Perspectives Research Methods Ch. 2 Discussion Board #1 due 3 W 9/28 Normative Aging; Longevity Physiological Aging Body Systems Sensory Systems Ch. 3 and 4 Quiz #1 due (Chapters 1-4, lecture 4 W 10/5 Functioning (ADLs/IADLs) Health Prevention & Promotion Discussion Board #2 due 5 W 10/12 Memory Review for Midterm Ch. 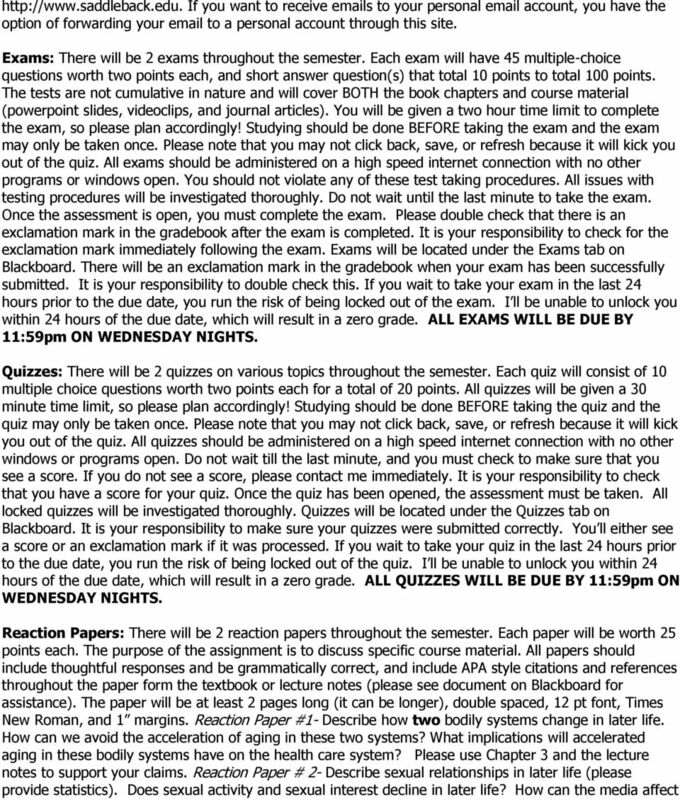 5 6 W 10/19 Midterm Exam (Chapters 1-5, lecture 7 W 10/26 8 W 11/2 9 W 11/9 10 W 11/16 Intelligence Cognition & Problem Solving Reaction Paper #1 due Personality & Coping Discussion Board #3 due Mental Health Quiz #2 due (Chapters 6-8, 11, lecture Social Relationships Discussion Board #4 due Ch. 6 Ch. 7 Ch. 8 Ch. 11 Ch W 11/23 Thanksgiving Break 12 W 11/30 13 W 12/7 F W 12/14 Employment & Retirement Living Situations Reaction Paper #2 due Death & Dying Discussion Board #5 due Review for Final Final Exam (Chapters 6-12, lecture Ch. 10 Ch. 12 I reserve the right to make changes to the syllabus. Students will be notified of any changes via course and an updated syllabus will be placed on the course website. Mullin, B. J., Hardy, S., & Sutton, W. A. (2014). Sport Marketing, 4 th Edition. Human Kinetics. WEST LOS ANGELES COLLEGE HEALTH 11 - PRINCIPLES OF HEALTHFUL LIVING JITENDRA KUCKREJA Adjunct Assistant Professor kuckreja@lavc.